Although we already had plenty of winter with several windstorms and plenty of wet, I think this is a perfect time to take a short trip down memory lane. 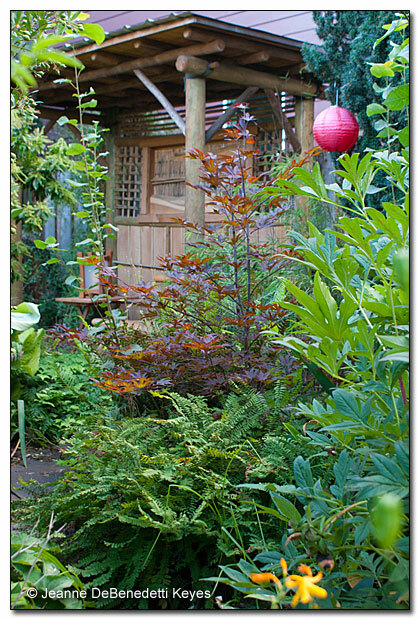 This time I photographed the several garden spaces around downtown Portland for summer and my own garden in late August. In addition, like the other seasons, I shot all of the pictures in the late morning hours. 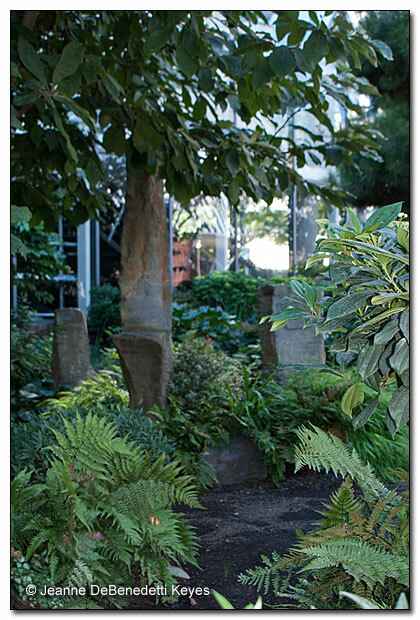 This photo of the Portland World Trade Center garden showcases the deep green of the Magnolia stellata overhead and lovely ferns in this shady space. The contrast between the lush, large foliage of plants like the magnolia and Acanthus mollis in the background, with the fine foliage of ferns and Hakonechloa macra is restful and appealing. The strong, upright forms of the columnar basalt rocks and gravel paths also provide a nice distinction with the round and mounding foliage of plants such as the Viburnum davidii in the foreground. There are no summer flowers, yet the garden is beautiful without them. Although, I think a large, blowsy hydrangea with big, white blooms such as Hydrangea macrophylla ‘Annabelle’ would look great here too! The garden at Tom McCall Waterfront Park really comes into its own in summer. I love the bright spots of scarlet in this photograph. 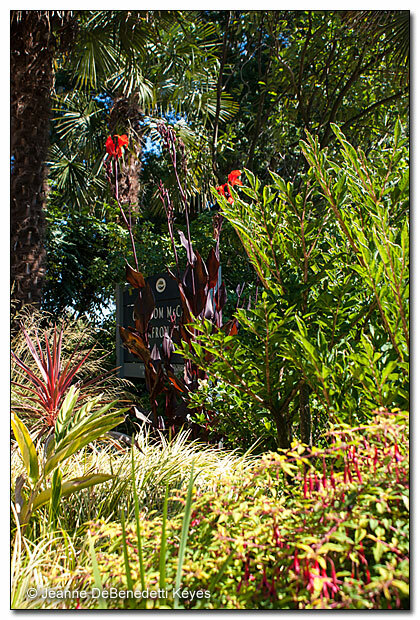 Around the sign is the deep, purple-red foliage and bright, red blooms of possibly Canna ‘Australia’. The dripping, red blooms of Fuchsia magellanica provide a nice contrast with the upright foliage of the cabbage palm (Cordyline australis). Yet, because they are all a brilliant red, the eye is drawn in and up into the canopy of the trees. The tropical looking foliage of Amorphophallus konjac also draws the eye up into the canopy, particularly to the palm (Trachycarpus fortunei), which also has tropical looking foliage. As I wrap myself in fleece, the image helps me daydream about a warm, sunny day on a Hawaiian or Caribbean island, instead of the reality of a Portland winter day, where I listen to the rain pelt the windows. Interestingly, this image (above left) of the Riverplace Marina garden is very similar to photos I took in the spring. The overall feel of the garden does not change much between May and August. There are definitely more summer flowers. You can see one of the cape fuchsia (Phygellius sp.) blooms hanging over the hedge on the right. Unfortunately, the lovely crape myrtle (Lagerstroemia indica), in the background was not in bloom. 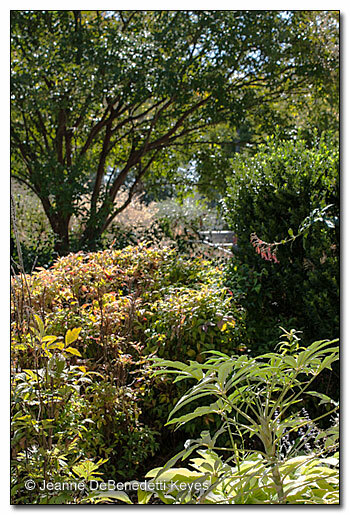 The next photo (above right), displays the same garden just to the left. 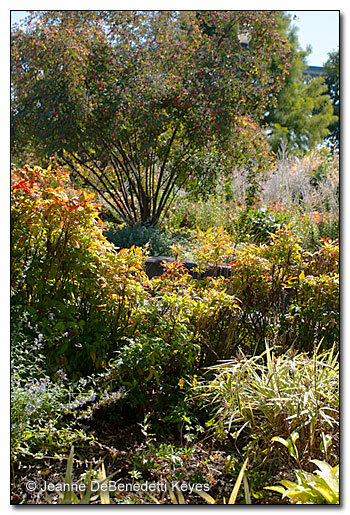 The heavenly bamboo (Nandina domestica) leaves echo the red and orange hues of a large, multi-stemmed rose’s (Rosa sp.) bright red hips in the background. 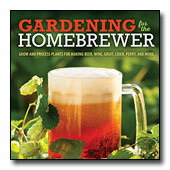 Lastly, I photographed my garden in late August. I try to look past the quaking aspen sprouts (Populus tremuloides), that I should have trimmed, so I can appreciate the dark red leaves of the Japanese maple (Acer sp. 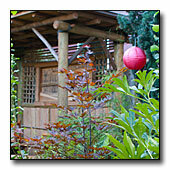 ), that coordinates with the red, paper lantern. The shape of the leaves matches the palmate fronds of the Fatsia japonica on the right. I try not to notice the weeds and the crispy, sun burned leaves of the maiden hair fern (Adiantum sp.) in the foreground. Instead, I appreciate that during the hot, dry days of what seemed like an endless summer, the plants survived and managed to produce a peaceful, living sanctuary in each of these gardens.